MANHATTAN — Brad Hoylman's headed to Albany. The former Community Board 2 chairman and longtime Greenwich Village advocate declared victory Thursday night in the Democratic primary to replace popular State Sen. Tom Duane, who is retiring. Hoylman won 69 percent of the vote with 94 percent of precincts reporting, after receiving endorsements from Democratic heavyweights including City Council Speaker Christine Quinn and Public Advocate Bill de Blasio. Hoylman said he was thrilled to receive voter support in the the 27th District, which covers Greenwich Village, Chelsea, Hell's Kitchen, the Upper West Side and parts of the East Village. 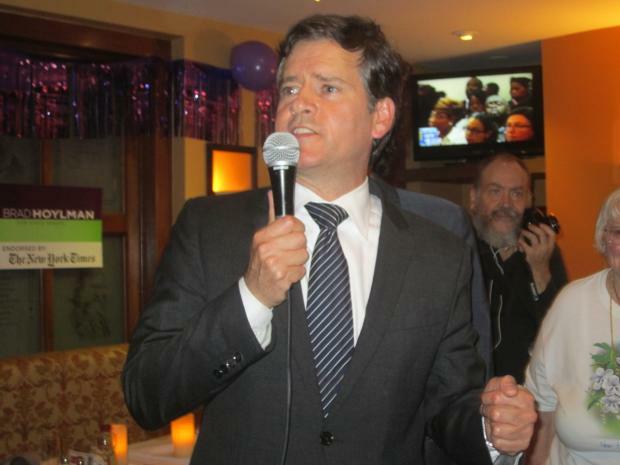 "We've got a lot of work to do," Hoylman told supporters in a victory speech at the Seventh Avenue bar and restaurant Mustang Harry's. Hoylman commanded a large lead over his challengers, Hell's Kitchen activist and bar owner Tom Greco, who received 24 percent of the vote, and public school teacher and former Yonkers NAACP leader Tanika Inlaw, who received 8 percent. All three candidates ran on similar platforms of campaign finance reform, support for LGBT rights and the protection of affordable housing. Hoylman, a 46-year-old Village resident and father of a 21-month-old, said at a debate in August that his 15-year track record with CB2, the Community Service Society and the Village Independent Democrats distinguished him from his opponents. Quinn, Duane, Assemblywoman Deborah Glick and other elected officials attended Hoylman's victory party and praised his win. "He's going to be awesome," Quinn said after Hoylman's speech. "I'm so excited to work with him in this new capacity." "There is no one I can think of who deserves a seat in public office more than my friend Brad Hoylman," Duane said. Critics of Greco and Inlaw — who did not immediately respond to requests for comment Thursday night — said that while the candidates had similar platforms to Hoylman, they had less of a public record than him. Village resident Chris Gaylord, an architect, said outside the polling station at P.S. 3 on Hudson Street that he voted for Hoylman but nearly selected Greco instead. "I got a positive impression of [Hoylman's] character and judgment at CB2 meetings, but I could have just tossed a coin," Gaylord said. "We generally have very good candidates in this area." West Village resident Edward Viechec, 58, said Greco's support of LGBT rights appealed to him. "I think he's very open to the different lifestyles in New York and that he would do a lot of good for New York," Viechec said after he voted at P.S. 3. Chelsea resident Tina DiFeliciantonio, a documentary filmmaker and CB4 member, said after she cast her vote for Hoylman that his face time in the district mattered to her. "If you take note that your elected officials are standing out there on a street corner at 9 a.m., that says something about their dedication," she said. Andrea Campanale, 75, who lives in Penn South, chose to vote for Inlaw, the only woman in the race. She said she met her at a candidates' forum and was impressed with what she saw. "I voted for the woman," she said. "I'm a woman and I support women." "I figured, let me take a chance on her," she added. After 14 years in office, Duane made the surprise announcement in June that he would not seek re-election in November. He told reporters that he planned to "start the next chapter of his life" as a New York City resident, instead of shuttling to and from Albany. Hoylman spent Thursday afternoon greeting voters throughout the district, shaking hands, handing out fliers and urging residents to vote. Duane said that the election was bittersweet, but that he would continue to stay involved. "I had a good 14-year run and I'll just be working to save the world in a different way now," he said. Pending results of the general election Nov. 6, Hoylman will take Duane's place as the only openly gay member of the State Senate. No Republican candidate is running for the seat.